Fada will continue to publish retail vehicle sales data on a regular basis and, from April, will also make public region-wise showroom sales data. 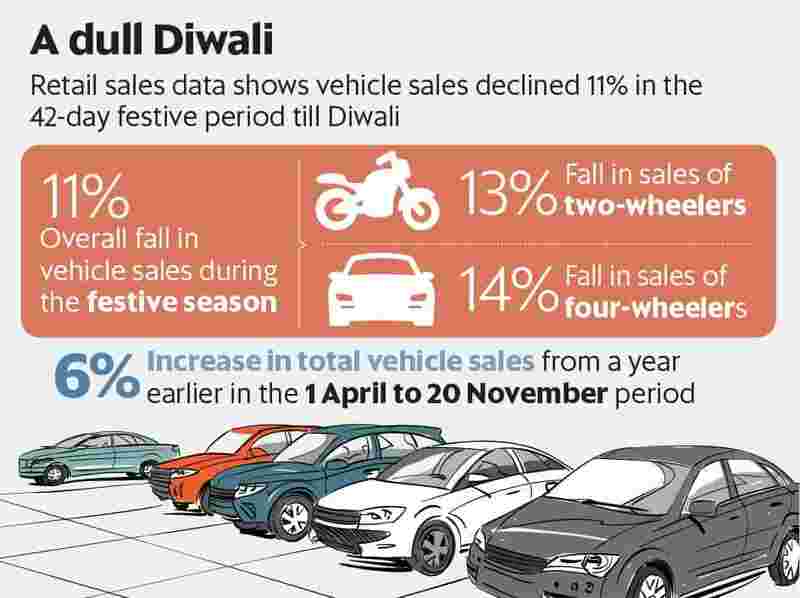 New Delhi: Total vehicle registrations declined 11% during the 44-day festive season that ended with Diwali, according to retail sales data released for the first time by a dealers’ association on Friday. The Federation of Automobile Dealers Association (Fada) cited the liquidity crunch faced by vehicle financiers as the main reason for slower sales. Registrations of two-wheelers fell 13% and four-wheelers by 14% in the 42-day period, Fada said. Industry lobby group Society of Indian Automobile Manufacturers (Siam) provides wholesale data, or monthly despatches to the dealers, on a monthly basis. The data released by Siam for October shows a 1.5% increase in sales of passenger vehicles while the same for two wheelers increased by 17.2%. The difference between the numbers provided by Siam and Fada could essentially be the inventory that the dealers are holding. A study conducted by Fada shows total vehicle registrations grew by 6% from a year earlier in the April to 20 November period, while two-wheelers and commercial vehicle sales grew by 5% and 30%, respectively. However, passenger vehicles, considered a big ticket purchase after real estate, declined by more than 1.4%, according to Fada, compared with a 6.1% growth shown by Siam data from April to October. The data compiled by Fada is accurate since it has been sourced from the Vahan website, where vehicle registration data is made available by the Union government, according to Vinkesh Gulati, vice-president, Fada. Representatives of Fada reached out to dealers who are still not part of Vahan to take stock of the situation. “We have been requesting Siam to come out with retail numbers as well but they are opposed to the move. Hence, we had to come out with our own data. As of now, automobile dealers are sitting on a huge inventory which is financially not viable. Market share data is what customer looks at but not dealers," added Gulati. According to the lobby group, the recent liquidity crisis in the non-banking financial companies (NBFC) sector does not augur well for the automobile industry in the remaining months of the current fiscal since a significant part of vehicle financing in two-wheelers and commercial vehicles is done by NBFCs. Two-wheeler and passenger vehicle sales declined the most during Dussehra and Navratri festivals while sales in the run up to Diwali recovered a bit since oil prices had started to soften. “We have not seen such a dull festive season in the past few years, as many negative factors came into play during this season which weakened the consumer sentiment and postponed their purchase decision. It is a matter of deep concern for our dealership community," said Ashish Kale, president, Fada. The lobby body has, for the first time, published vehicle sales numbers based on the registrations of vehicles in the 42-day period during Dussehra and Diwali. Almost a third of the overall sales of automobiles are generated during this festival season. Apart from subdued two-wheeler and four-wheeler vehicle sales, the industry body is also concerned about slower commercial vehicle sales in the second half of the fiscal due to a base effect and cautious approach of NBFCs in offering credit.